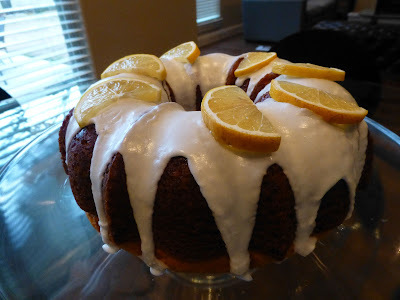 Unfortunately, my husband chose lemon cake for his birthday. Call me selfish, but I was really hoping for chocolate. Lemon cake has always confused me a bit, but maybe as I get older and my taste buds mature I will come to appreciate the lighter and fresher taste a lemon cake has to offer. That being said, this was definitely tasty. I would never choose it for my birthday, but this was good. I imagine making it on a crisp spring day and enjoying it with a hot cup of tea in the garden. I don't like tea, but I'm sure some day I will. Preheat the oven to 350 and grease a bundt pan. Mix all ingredients, pour into the pan, and bake for about 40-45 minutes. Let cool for about 20 minutes before dumping it out. LESSON LEARNED: Do NOT buy the Betty Crocker cake mix. I did this the first time, and it turned out really small and really dense - it turns out the cake mix is 3 oz smaller and already includes pudding! For the frosting, mix all ingredients with an electric hand mixer. Add only enough milk to bring it to the right consistency. Drizzle over the cooled cake, and garnish with lemons.